ntsocialism. : A closure to Bangalore. My time in Bangalore, India is coming to an end. Earlier last fortnight, my mind kept wandering during my daily hourly cytotron treatment in Scalene Cybernetics Ltd. You tend to think a lot when you’re immobilized; some happy thoughts and many profound. Then my mind kept urging me to go to the theme of love. Yes, without a doubt, I have experienced tremendous affection from people all around me back home in Malaysia and in India. Even so, I’ve been unable to maintain a good relationship with my fussy and scheming former guesthouse host here in Bangalore who has made me a ‘persona non grata’ during my stay. I was quick to realise his scandalous ways and immediately sought after another place to stay - which turns out to be the exact opposite of his morbid home. Furious in the name of justice, I compensated those emotionally exasperating thoughts by consoling myself; telling myself repeatedly that you win some, lose some and then you forgive. Considering this insight, of course there are times that I could have understood some Bangaloreans better to have long conversations about how they see themselves in 5 years’ time. Because of the language barrier, you often rely on intuition, eye contact, body language and body gestures to speculate what they’re trying to communicate across to you. Fortunately, I’m Asian so I think I got my guesses right most of the time! And then, there are always the enjoyable but hazardous auto-rickshaw rides I’ve had during my time here, an essential form of transport in Bangalore. I’ve posted on this particular subject before so in epilogue, I just want to summarise that an auto-rickshaw ride is like an FPS (first-person shooter) game gone bad. It’s like a Japanese/Thai horror genre film in first person; you just shut your eyes to skip the stomach crawling parts. Hygiene and toilet manners are huge problems here with a lack of recycling facilities available for the rural parts of the country. You often spot civilians throwing cigarette butts and plastic cups just about everywhere you can imagine. As toilets aren’t freely available within certain areas - and toilet papers very costly - there is also a tendency for the working class to urinate openly into drains and public grounds. 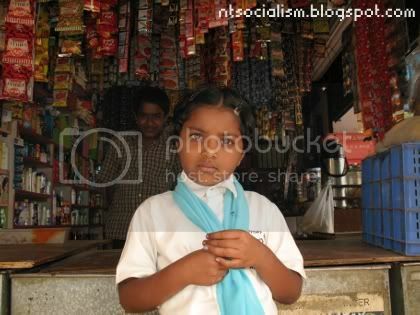 A primary school kid hanging outside a convenience store located in the village area. Food delicacies of India remain a muted fascination because I hardly had a chance to explore the city’s celebrated restaurants. The eateries that I’ve been to failed to suppress my reverence that Malaysian food is still ‘numero uno’. I still bleed Malaysian and yearning for home. I can’t wait to get back to good ol’ Penang for some wok action! Here’s a little holler at you, Uncle Tony! In addition to that, wheat consumption is evidently just as high as rice so bakeries are a norm. I noticed that bakeries usually operate as convenience stores too; sprouting in every village corner. However, don’t expect them to carry condoms! In response to a friend who has urged me to pay a visit to the Bollywood cinemas, I regret to feedback that most old picture houses have been replaced with the new and that a cinema ticket costs double what we would pay in Malaysia. Yes, how strange...considering the non-existence of piracy, at least in the Bangalore city area. 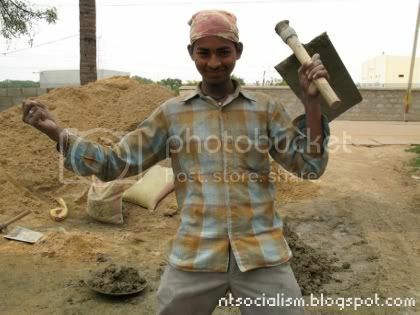 A young construction worker in Bangalore. Bangalore isn’t all that bad and just about missed opportunities. One good thing about life here is that you’re often surrounded by professionals and intellects. By making affordability and availability of books a norm, they have caused a domino effect in addition to championing their nation’s wealth of writers. I envy the pace of their writers’ output! Stores and sidewalk bookstands’ sales are driven by the good sales they enjoy selling fiction and non-fiction works from the world’s literary greats. This has ultimately spawned a wide array of genuinely powerful thinkers to drive Bangalore in the future. And while we’re on the subject of affordability, I reckon that India is the only place in the world where you can get a USD$0.80 haircut! Cheap haircuts and a nice backrub...all in one place! All your daily needs here along the streets of Sivajinagar. Another reason why I’ve been happy throughout my time here was because a lot of people in Bangalore have proved my preconceptions wrong. 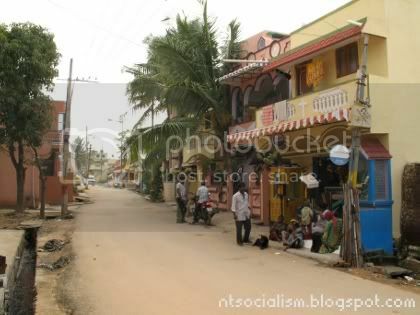 You’d be amazed by the amount of diligent and warm people here, doing their best to make an honest living. 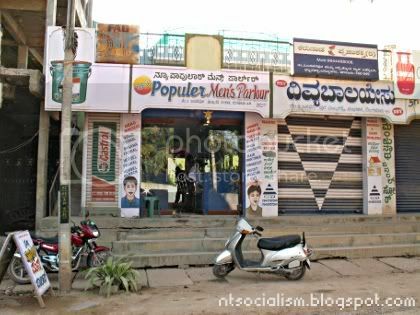 India (or Bangalore rather) is a nation full of potential – if only there was a better form of governmental leadership and a system that is humanely concern about the grouses of its people. The commoner (or as Aravind Adiga kindly put it – ‘half-baked’ Indians) here suffers greatly from absence of sustainable opportunity. 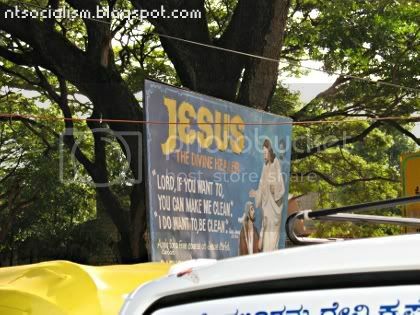 Despite difficulties, it’s heart-warming to see that Bangaloreans are truly kings and queens of street marketing. 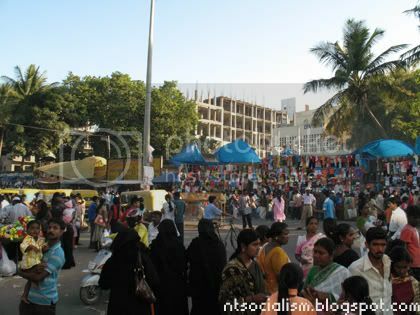 They make the ‘pasar malam’ scene back home seem trivial as most night owls flock street markets here (i.e: Devasandra Main Road and Sivajinagar street market) in mammoth numbers. Mr. A. Arputhan, the sweet comedian who happens to be in the same boat as yours truly. I also enjoyed my nightly couch talks with fellow patient, Mr. A. Arputhan, who works as the Assistant Director for the State Income Tax Board (Lembaga Hasil Dalam Negeri). 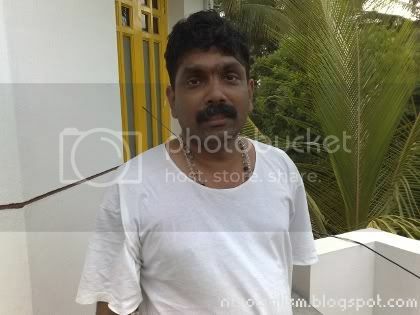 Apu; shortened that way as ‘arpu’ in Tamil means ‘to itch’, also from Penang, suffers from glioblastoma. Despite the occasional gibberish resulting from his ailment, the daft comedian remains a very loving father, who displays the meekness of a virgin cow. Through my observation of Apu’s state of mind post-surgery, I’m encouraged to seek solace and comfort in the things I already have. He remains in Bangalore for the next fortnight so I bid him best of faith and that the Lord will raise him up for the challenges ahead! To summarise it all, Bangalore is still a very pleasantly economical place to visit but be visceral and budget-savvy so that certain circles of stereotypical Asian opportunists don’t milk you dry. Nothing is perfect with or without cancer. Despite all these accumulated exposures (28 days' worth of 1 hour cytotron treatments & 14 days' worth of 2 hour cytotron treatments) and experiences, I am heading back home to Malaysia praying for a miracle. My new MRI scans will take place in a month's time. The last scan done upon completion of my 1st 28-day cycle showed no significant increase in the cancer mass in my brain. However, with it being physically there and active, I remain wary about what to expect in January 2009. And whatever’s to happen thereafter is anyone’s guess. But what I’m certain of is that God has bestowed me with a gift - or you could categorise it as a divine miracle – that I have the gift of a strong will power to live. I think most people here and back home that know me or have seen me would bear testimony to that. This great gift from our graceful Heavenly Father will carry me forward to the end of the race and I will continue to keep the faith and shout my thanks to the Lord (Luke 17:15) that is merciful to me. I’d like to extend my gratitude to the people involved in making my stay in Bangalore a pleasant one and also to the people back in Malaysia who have kept us company with their text messages and prayers. My next post will be on my cytotron treatment in Bangalore. See you guys down the line!